Lay foundation stone of one project; Congress accuses them of wasting public money on lavish functions. Just three days before the model code of conduct comes into force, a total of six projects were inaugurated and the foundation stone of one project was laid by the Bharatiya Janata Party (BJP) leaders. The Chandigarh Municipal Corporation elections are scheduled to be held in December. 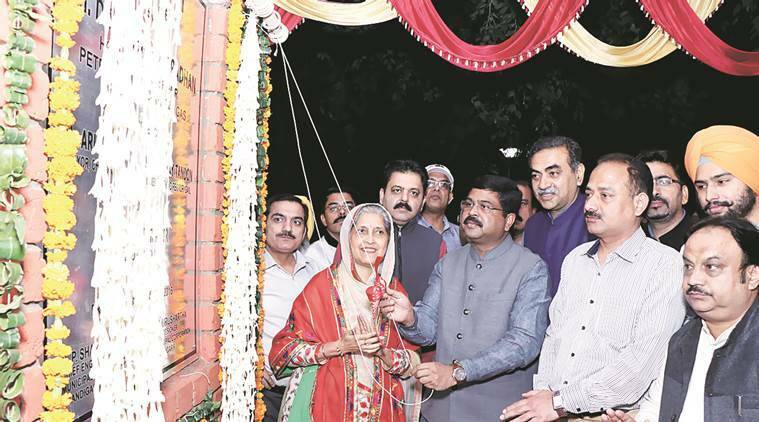 Union Minister of State for Petroleum and Natural Gas Dharmendra Pradhan inaugurated the ambitious piped natural gas (PNG) project, which is a joint venture of the Indian Oil Corporation Ltd (IOC) and Adani Gas. Jagdeep Kumar, a resident of SBI Colony in Sector 49, became the first person in the city to get supply of cooking gas through pipeline. From Saturday, PNG will be supplied in all the 200 economically weaker section (EWS) houses in the rehabilitation colony in Sector 49 and 50 houses in SBI Colony. An elated Jagdeep Kumar said that PNG would make life of his family easy. In the first phase, PNG will be supplied in five sectors — 7, 8, 49, 50, 53 — and EWS flats at Dhanas. IOC-Adani aims at providing 7 lakh PNG connections in the city in the next five years by laying pipeline measuring 1,750 km. The total cost of the project is around Rs 450 crore. IOC-Adani has the exclusive contract for supplying PNG in the city and nearby area for a period of five years. The Petroleum and Natural Gas Regulatory Board (PNGRB) has allowed the firm to fix the final selling price of the PNG to be supplied to consumers. Pradhan also inaugurated two compressed natural gas (CNG) stations in Chandigarh, one in Sector 44 and the other in Sector 56. The aim is to provide CNG to over 30,000 vehicles through 30 CNG stations in the next two years. Natural gas, Pradhan said, is a clean and environment-friendly fuel and is also 20 per cent cheaper than conventional fuel. The minister inaugurated a green belt developed on land measuring 1.16 acres at a cost of Rs 25 lakh. He also inaugurated installation of dustbins in the parks provided by GAIL under corporate social responsibility (CSR) scheme to the municipal corporation. Local MP Kirron Kher inaugurated an AC gym in Sector 48 community centre and green belt in Sector 48. She also laid the foundation stone of a 100-bedded hospital in Sector 48. With an eye on MC elections, Kher has inaugurated around 30 projects in the last two months. Lashing out at the BJP, president of Chandigarh Congress Pardeep Chabbra said that they were wasting public money by hosting lavish inauguration functions.